It’s been an honor and privilege to serve as the Executive Director of the American Association of Legal Nurse C onsultants for the past five years. I have met and developed meaningful relationships with so many wonderful people through this association. AALNC members never cease to amaze me with their professionalism and dedication to the LNC community. I want to take a moment to thank those around me who have helped to support the growth and development of this wonderful organization. I have had the pleasure to serve with several AALNC boards over the past years. 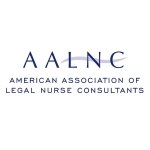 Their ability to envision legal nurse consulting helped me to drive our programming forward to meet strategic goals and the needs of the membership. I have been privileged to work with wonderful staff and I know that the support of an engaged, professional and competent team is critical to an organization’s overall accomplishments. Together, I believe we have accomplished great things for AALNC. I leave you in great hands with Jena Stack and wish AALNC much continued success. As a new year begins, many of us use this time for reflection and visioning for the future. This holds true for me as I begin my service to you as AALNC’s new Executive Director. I have already had the great pleasure of getting to know the AALNC Board of Directors, witnessing all the great work of AALNC’s volunteers, and observing the passion and dedication of its members! Their energy and passion for the field is contagious and I cannot wait to see what this year will hold. Together, we will continue to accomplish great things for this important field. I know change is not always easy, so I wanted to use this letter as an opportunity for you to learn a little about me. I have had the pleasure of working in the association management business at SmithBucklin for the past five years and previously worked in other non-profit management and education settings. My work has centered around healthcare organizations, ranging from clinical laboratory managers to sleep professionals. I have a Master’s in Education Administration from Loyola University Chicago and am a Certified Project Management Professional through the PMI Institute. I have been successful at implementing strategy, change management, and building relationships, but by far the best part about my role is working with passionate volunteers and helping them see their vision of the association come to fruition. It is a privilege for me to come alongside you and partner together in advancing the legal nurse consultant profession. Since being an employee of SmithBucklin, I have watched AALNC grow and accomplish great things for its members and the industry. I am thrilled at the opportunity to work with you in continuing to grow the association and adapt to the ever-changing healthcare environment. I look forward to meeting some of you at the Annual Forum in Louisville and welcome any questions you may have. Please feel free to reach out to me directly at jena.stack@aalnc.org or 312.673.4751. I wish you all a wonderful 2019!